Home / Warhammer 40K / Tactics & Meta / The Winds of Change!! FAQ!! Hi Guys! 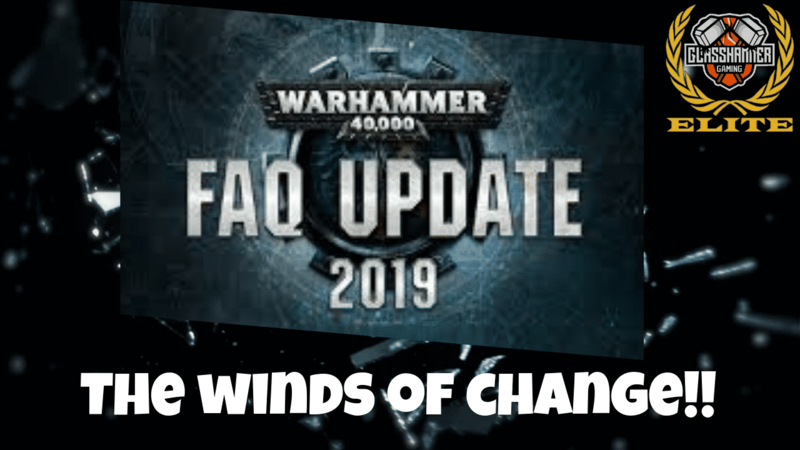 The next big FAQ should be dropping any day now and i’m sure everyone is sitting there waiting to see what changes are coming to their armies, and even more importantly what changes there will be to the armies of your regular opponents! So i thought this would be the perfect opportunity to hit you all up with Mystic Mani’s predictions for the top 5 units, abilities or armies i think are going to be hit by the almighty nerf bat! These guys are literally being taken by every single imperium player, or at least one of these is being bought pre game with the stratagem. They are brutal for their points and people can choose which one they would like to include in the list once they know what they are playing against. I reckon Games Workshop didn’t intend for every single person to be taking at least one assassin in their army and maybe they have made them a little to good at what they do, for that reason i have a small tingly feeling telling me that these guys right here might be picked on a little when this FAQ comes! So this is one that i would like to see myself personally! It’s regarding the new beta bolter rules where bikes, terminators, vehicles and models who have remained stationary with the adeptus astartes keywords can fire their double shots for rapid fire even at long range. I really like this rule myself as marines aren’t seen very often on the competitive scene at the moment and it would be great if more people were using them however i doubt that it was intended for deathwatch to get those same bucket tonnes of shots but be able to use ammunition to wound on 2’s against most thing in the game lol!! For that reason i’m predicting that Deathwatch will either lose the beta bolter rules altogether or will have to choose whether they want to use beta bolter rules or special issue ammunition each time they fire their bolter weapons!